First Aid Courses are essential for learning how to deal with accidents and injuries both in and outside of the workplace. At EM Training Solutions Ltd we are a fully authorised training provider for a range of different compliance and Health and Safety courses. We specialise in providing high quality training which is delivered by experienced industry professionals, to ensure that you are fully equipped to deliver emergency first aid at work. Learning first aid skills is particularly important for those working in a high risk environment such as construction. 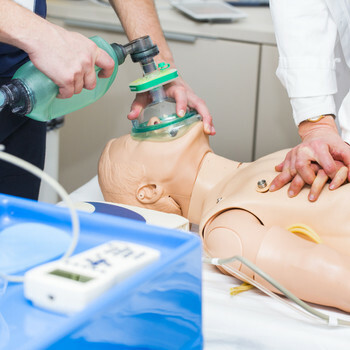 At EM Training Solutions Ltd, our first aid courses are carried out by professional trainers in our London training centres and give you the required skills and confidence to respond to a number of accidents and first aid emergencies which you may face in your work place. All of our prices include certificates, exams and course materials - there are no hidden costs or charges! Who will benefit from First Aid Training? Our quality First Aid Courses at EM Training Solutions Ltd are suitable for anyone over the age of 16 that works in a high hazard environment such as construction, manufacturing or agriculture. They are also ideal for organisations that identify a requirement for first aid training or assessment. Our first aid courses cover basic first aid skills and are also suitable for members of the public that wish to learn how to perform first aid. What does a First Aid Course cover? If you'd like to book a First Aid Training Course with us, then please get in touch now and express your training needs or give us a call to enquire about any of our other compliance courses. We also provide Fire Marshal Training Courses , as well as CSCS and Rail Courses. We offer the highest genuine pass rates and expert training with no hidden costs or charges; book now! This First Aid at Work Course focuses on AED Theory and the Practical elements as per HSE requirements. It includes information on how to deal with an emergency, how to assess a casualty, where to get help, electrical incidents, accident recording and reporting and more. Once you have successfully completed this course, you will be awarded with a first aid certificate which is valid for three years and will be a fully qualified first aider!